This is my last post for the Vegan Month of Food. I enjoyed being a part of this again very much. It has been a great September and I found so many awesome new blogs. I read a lot of inspiring posts and saved plenty delicious looking and unique recipes. Thank you very much to everybody who read my posts. Extra special thanks to those who also took the time to comment or even tried one of my recipes! For me you’ve made every single day during the month of September. For this Vegan Month of Food I wanted to do an A to Z of German desserts. Even though I baked a lot this month I wasn’t able to complete my list and to accept everybody’s requests for recipes. Today for example I’ll end VeganMoFo with the letter T although I got several requests for S as in Schwarzwälder Kirsschtorte and Sachertorte (which is very Viennese and not German at all but still a popular dessert here). And where the heck is the rest of the alphabet? But don’t worry. I will carry on with my project during the next months and I am already working on the S.
The cake I have for you today is a traditional German cake in an unique way. It is called Tschechischer Käsekuchen (Czech Cheesecake) but I honestly doubt that it is Czech. The original version is both made with Quark (fresh curd cheese) and poppy seeds and some people might consider this typically Czech. But this combination can be found in many German and Austrian cakes as well. So why did I include it in this list? I think what makes this cake very German is the fact that it is from a Dr. Oetker baking book and calls for quite a few of their ingredients. (Dr. Oetker is the German version of Betty Crocker.) And by ingredients I do not mean baking powder. I mean those ingredients that are supposed to make baking and desserts easy for you. Easy, if you think you don’t have the time to make stuff from scratch. Or if baking intimidates you. I know many people who use cake mixes and other convenience products for baking. I don’t think there is anything wrong with it. I grew up with all these little packages filled with some powder that magically turned into custard or cake if you added just a couple of fresh ingredients. And in our household those packages were always made by Dr. Oetker. If you didn’t use their products, you probably had one or two of their baking books, which are filled with easy and often foolproof recipes. These days I don’t buy their products because I like to make stuff from scratch. Plus, most of their products aren’t vegan anyway. 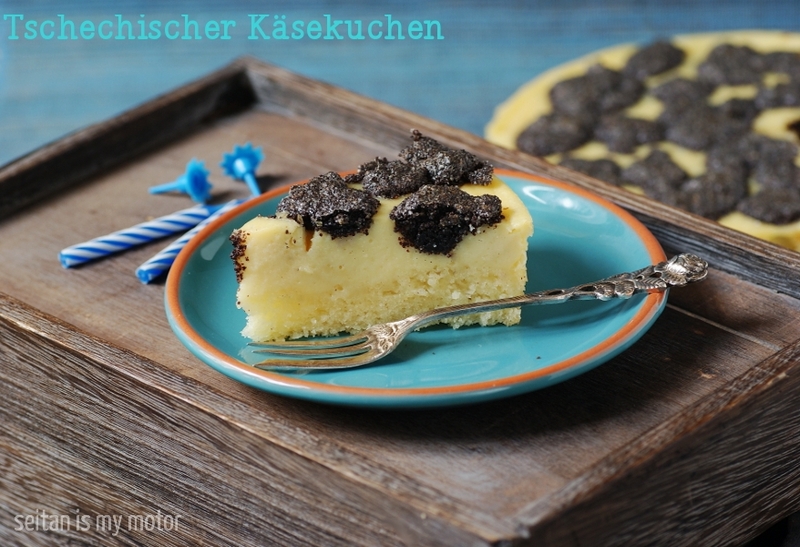 But I thought it was a nice challenge to try to veganise a cake that calls for Mohnback (prepared poppy seed cake filling), Vanillepudding (vanilla custard), and Saucenpulver (instant vanilla sauce powder) in one single recipe. My cake probably came out a little differently than the original version. Which doesn’t matter because veganising and improvising something often takes you in another interesting and new direction. And that is what vegan baking and cooking is all about! Making this cake was much easier than I thought. The crust calls for curd cheese and cream, I just made a spongecake. The filling, which calls for curd cheese, eggs, vanilla custard, and that weird vanilla sauce mix was made with yoghurt, starch, sugar, chickpea flour, and coconut oil instead. It came out very firm and custard like. But I imagine the original would have come out like that, too. For the poppy seed topping I just used my own version for poppy seed cake filling, which works just as well as a storebought filling. Grease the pan and set aside. I wrapped my springform pan in alumninium foil to prevent the batter from leaking. Preheat oven to 200°C (400°F). Combine flour, sugar, baking powder, and salt in a bowl and mix to combine. Add soy milk and oil and stir until combined. Pour into cake pan. Prebake for 15 minutes and remove from oven. Combine all ingredients in a food processor and process until smooth. Pour over the prebaked crust. Combine poppy seeds, sugar, and vanilla. Add hot water and oil. Stir well until oil has melted and everything is combined. Stir in flour and starch. Use a spoon to distribute on top of the cake. Bake the cake for another 30 minutes. Remove, let cool and use a knife to loosen the edges. Carefully remove pan. I absolutely love dessert. Who doesn’t, really? I love taking risks with it and making recipes that are totally different than the norm and this covers it! I can’t wait for an occasion to try it out! I’ve loved your posts all month long. I am amazed every time by how amazing your food looks! I feel like visiting Germany again! Mihl! Congratulations on finishing your unbelievably impressive MoFo! Really, yours was one of my favorite Mofos to read. I’m just in awe of your amazing dessert-making skills! You are pretty awesome. This one looks, of course, so good! I have a lot of poppy seeds…actually, I think I have all of these ingredients at the ready, but only half the required amount of yogurt. Is there a potential substitute for that, or should I wait till I’m properly stocked? Thanks for all of these amazing recipes! So lovely! I adore poppy seeds in desserts and I might have to try this. My sweetheart is nervous about my making vegan pudding-type-things (there was a banana pudding incident years ago) but I feel like your creations could not possibly ever lead me astray! How I miss this! Your work for this MoFo is remarkable and cannot wait for the Schwarzwälder Kirsschtorte, my favorite! oooh, I am a big fan of custardy desserts, and I love the German poppyseeds-in-desserts thing… so this one is right up my alley!! I pretty much have to bookmark your whole entire mofo for this year. SUCH AMAZING POSTS, Mihl!! and I am so glad you’re going to keep poking away at this project. :) I can’t wait to see what else you come up with to share with us! OH YEAH! I know of a few people that would love this! What a beautiful dessert. I’ve never used poppy seeds before but they certainly seem to feature in a lot of German sweets. Congratulations on completing your posts for Vegan MoFo! I agree, it’s been a great month and I’ve got so many recipes stored up as well as a lot of inspiration. I’ve done 21 posts and am up to “U” in the alphabet but want to finish so am going to try and keep posting every day until Thursday! Congrats on finishing the month! I’ve really enjoyed drooling over your creations, and learning about all sorts of delights I’d never heard of. This poppyseed topping is very interesting – I don’t think I’ve seen anything like it! Dr Oetker is mainly seen as a purveyor of ‘Italian-style’ frozen pizzas here in France, strangely enough! Thank you so much Mihl for sharing these amazing recipes. I am looking forward to trying more of them. I am so glad you will be continuing this theme after Mofo. You are a star – keep shining! I have really enjoyed reading your MoFo themed post. My dad’s side of the family is German, though he is not a baker and my grandparents were in a different state (and I don’t think they did much baking either), so I feel an odd kind of wistfulness towards these recipes. Vegan Mofo might be coming to an end, but it’s not like I’m going to stop following your blog or anything, I need to see what Z is going ot be! :) I’ve seen plenty of Dr. Oetker products but I had no idea that it was basically the German version of Betty Crocker. I like premade stuff every now and then, but it’s always more interesting and fun to make something yourself, I’d much rather get my learn on. I’m super impressed with how you veganized this one Mihl, it looks incredible! Congratulations! You easily had my favorite theme of the month! I also am very intrigued by this poppy seed topping. I love them, and never know what to do once I buy a bag. A pound lasts far too long. This seems like a great way to use some! how cleverly you veganized this. It looks so nice. I love finding out all about traditional German cakes..thank you! aber deiner sieht wesentlich besser aus! Veganizing custardy things is always a challenge to me…this looks melt-in-your-mouth delicious and easy enough for even a kitchen klutz like me to try. Thank you for sharing the recipe!